In this episode of The Transformative Leader Podcast, I am honored to bring you a discussion with fellow kindred spirit, hugely successful advertising entrepreneur, and genuine transformative leader, Jacob Baadsgaard. I know that I describe many guests as “kindred spirits,“ but it applies even more when it comes to Jacob’s story and his approach to business and leadership. We both had a similar entrepreneurial experience, from realizing that our skills were not being fully utilized in the corporate world, to starting our businesses free of debt, and experiencing massive growth as a result of our “serving others first“ approach. Jacob is one of those truly extraordinary individuals who, unlike many in the corporate world, gets “it.” He gets the essence of so many topics that I try and emphasize in my weekly blog posts: the importance of people, of “soft skills,“ of servant leadership, and of the motto, “I am the One, and it’s not about me!“ From our brief conversation, I could tell that Jacob was truly a self-realized Transformative Leader operating in the space of entrepreneurship, doing extraordinary things in both business and life. He is focused not just on his own success, but passionate about the success and excellence of others, in his business and community. I could go on and on, but suffice it to say, no one will want to miss this fascinating interview with such a rare and exceptional leader. During our conversation, it was clear that Jacob attributed must of his success to his servant leadership approach to both clients and employees. He emphasized that pursuing self-enrichment as a goal would hamstring any long-term success, and that the most effective way to achieve success in any area was to pursue significance in the eyes of clients and employees by providing them with undeniable value. Instead of focusing on your own personal gain, as many entrepreneurs do, Jacob attributes his business’ massive success to creating a culture in which serving others is the top priority. In this way, Jacob’s experience provides firsthand proof that focusing on people, servant leadership, and “soft skills“ is not just about helping employees “feel better.“ It legitimately leads to extraordinary results and employee satisfaction. when implemented from the ground up, and it shows that businesses don’t have to choose between impact and influence, or success and fulfillment. Beyond insights into leadership, Jacob also shared some advice for entrepreneurs out there looking to reach their ideal clients in the marketplace, providing tips on what to do and what not to do to achieve marketing success. It was truly an honor, and I hope to reconnect with Jacob in the future again so that our listeners can learn even more. Jacob Baadsgaard founded Disruptive Advertising in 2012 and has since grown the company to 120 employees and $15 million in annual revenue, with no signs of stopping any time soon. Disruptive Advertising helps businesses advertise profitably on Google, Facebook and Instagram, by leveraging their software and team of marketers. While most business leaders focus on personal financial gain, Jacob reinvests a significant amount of his profits back into his employees and the community, donating monthly to causes chosen by employees and developing employees with no experience into leadership roles earning six figure salaries. Jacob is a regular contributor to sites such as Forbes, Entrepreneur, SearchEngineLand, MarketingLand, SearchEngineJournal, Unbounce, and KissMetrics..
To learn more about Jacob or reach out to his company, visit his website. You can also connect with him on LinkedIn at @jakebaadsgaard. Editor’s Note: Unfortunately, there were some technical errors during the recording of this episode that led to audio glitches and artifacts throughout, which were unable to be removed. We apologize for the disruption this may cause to the listening process, and hope you enjoy the content nevertheless. 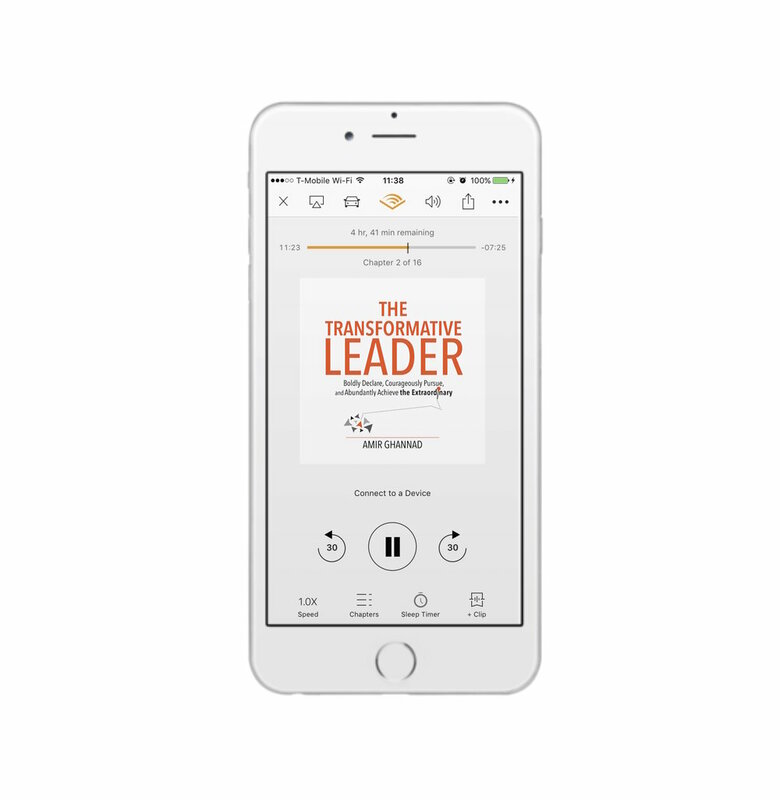 The Transformative Leader Audiobook is available now! I'm so excited to announce that "The Transformative Leader" on audiobook is currently on sale now exclusively on Amazon, Audible, and iTunes! The wait is over for those of you who (like me) prefer to listen to books during their commute or while exercising or simply doing things around the house! If you aren't yet a member of Audible, you can use this link (https://adbl.co/2MZWmaF) and sign up for a free 30-day trial and receive "The Transformative Leader" audiobook for free (plus one credit per month thereafter)! About the Author: Amir Ghannad is an international keynote speaker, author of The Transformative Leader, leadership consultant, culture transformation champion, and founder of The Ghannad Group. He has made it his life's work to guide leaders and equip them with the tools, skills, and the mindset necessary to create extraordinary workplace cultures that deliver breakthrough results. Download his free e-book, titled 5 Practical Steps to Make Your Culture Transformation Stick by clicking here. As always, have a great week! May you Boldly Declare, Courageously Pursue, and Abundantly Achieve the Extraordinary! Copyright © 2018 The Ghannad Group, LLC, All Rights Reserved.